If you have horses, or equine of any variety, and you are feeding square bales of hay, you, like Cowboy and me, probably have baling string coming out of your ears. The problem with baling string is that the stuff is just plain useful, and it makes it hard to part with. Many a time Cowboy and I have been working on a fence panel or hanging a fly catcher only to find ourselves hunting a piece of baling string. The stuff is tough. Heck, it holds weighty bales of hay together. 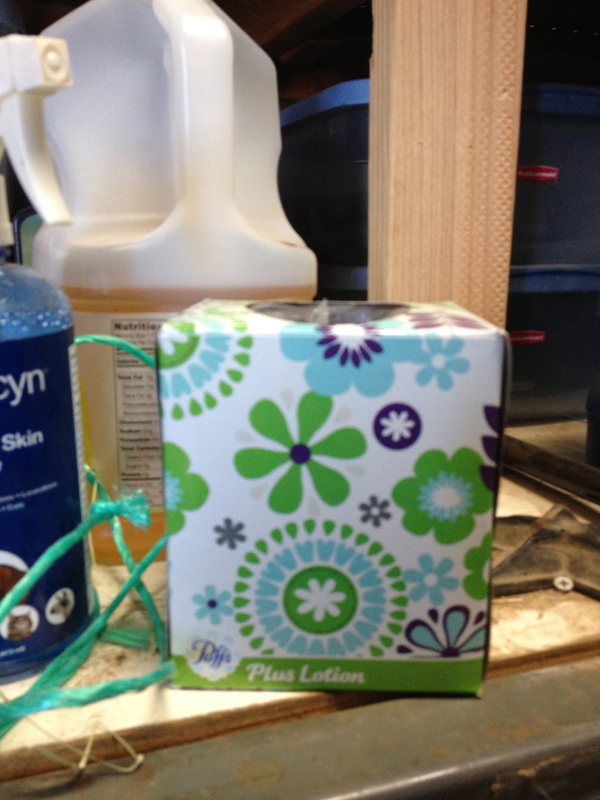 Now as I’v mentioned before, cleaning is certainly not one my fave farm chore as country life is dusty, but this farmgirl loves to organize and find interesting new uses for old things. So for you collectors of hay string, try this one on for size. All you need is an empty tissue box, or two or three depending on how much string you want to keep. First, take your string and tuck it (or stuff it) into the box. You’ll be surprised how much that little box can hold. 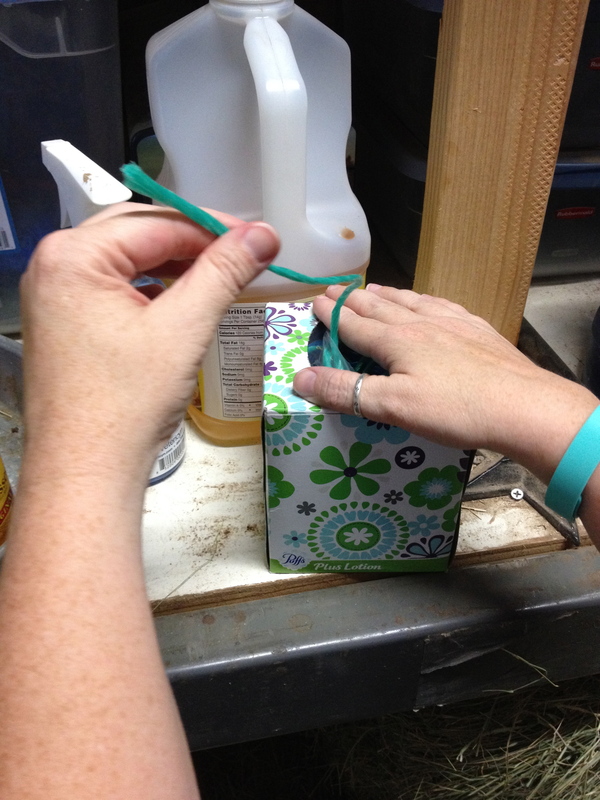 Use an ordinary empty tissue box to tuck your hay string into. Then, when you are ready to pull out a piece of string, simply hold your hand over the opening, and pull out a piece of string. To pull out string, simply cover the opening with your hand and pull. 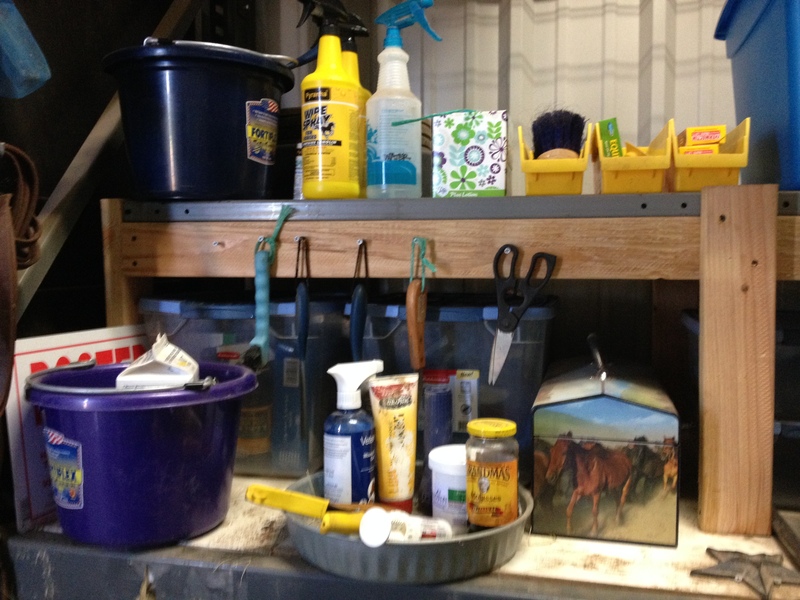 Tack room shelves – organization complete with tissue box full of string. From one farmgirl to another, I hope you find this tip helpful, because if you are anything like me, you just don’t need one more thing to trip over.